This mini-album (seven songs, less than 30 minutes) has a lot of seemingly dated sounds which not even fall under the nostalgia category, but are helplessly antiquated. Chaka’s voice, still in amazingly good shape in those few parts where her voice is undisguised, is mostly buried under heavy synths and a lot of reverb. The repetitive title track opens up the collection and instantly shows its redundancy. But it’s getting worse. Chaka’s voice is excruciatingly alienated on “Like A Lady” except for her typical scream in one segment. The song has absolutely nothing to offer. 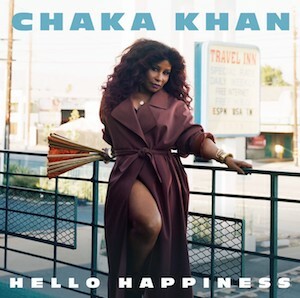 Mind you, this review comes from an avid Chaka Khan fan who has all her LPs (and those of Rufus) at home, but when I heard the rock intro to “Don’t Cha Know”, I just couldn’t believe my ears. You can’t even describe the tune as a proper song because it is so “kaputt” re: songwriting skills that it is hard to believe that there were five people actually involved in writing this. There is a very weak copy of an Amy Winehouse groove and aesthetic on “Too Hot” where her voice is so hyped up that it almost hurts. Here, there are even seven people responsible for the song and the production is totally derelict (BOT, Sarah Ruba Taylor, Switch, Troydon Murison). Even the first single off the album, the funky “Like Sugar”, has already lost any of its charme that was there during the first listen. The song is not really flowing, has too many breaks and starts to wear out soon because of its cheap repetitiveness. The reggaefied “Isn’t That Enough” again sounds more like a sketch than a proper song and the guitar opening to “Ladylike” sounds promising at first, but gives way to another improperly weak track. In The New York Times article, Chaka is asked about her next projects: “I’m working on a Joni Mitchell project right now, who’s a great friend. I have her blessing. I’m doing my favorite songs of Joni’s.” Let’s hope that she’s helping her getting her true artistry back.